Josh Peck wears black high top Converse All Star “Chuck Taylor” sneakers in the series. Drake Bell wears white and black high top Converse All Star “Chuck Taylor” sneakers in the series. 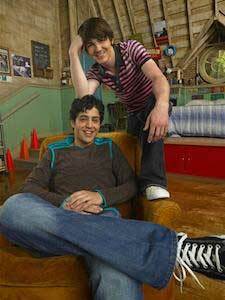 The titular characters, Drake (right) and Josh (left). 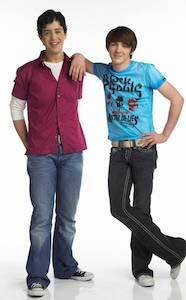 Drake & Josh was a sitcom that aired on Nickelodeon from 2004 through 2007. It follows the adventures of two step-brothers named Drake (Drake Bell) and Josh (Josh Peck), whose parents just got married to one another. They have to navigate through their new lives together as a family alongside their younger sister Megan (Miranda Cosgrove). The cast is rounded out by their parents Walter (Jonathan Goldstein) and Audrey (Nancy Sullivan). 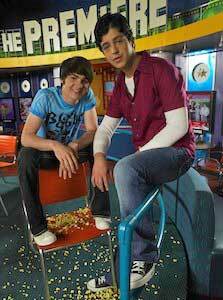 Drake and Josh at the movie theater where Josh works. Drake & Josh takes place in San Diego, California. 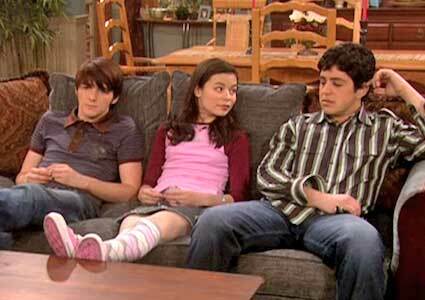 Drake and Megan’s mom has just married Josh’s dad, and the show covers how the kids deal with that transition. Drake and Josh initially clash with each other based on their opposing personalities. Drake is a popular, womanizer, musician who is irresponsible and reckless in his decision making. Josh, on the other hand, is a sensible and responsible young man who rarely gets into trouble, and has a hard time meeting girls. Adding fuel to their fiery relationship is Drake’s younger sister Megan, who is manipulative and conniving, and loves nothing more than making Drake and Josh’s lives miserable. However, over time, Drake and Josh really bond, and become true brothers in every sense of the word. Megan wearing pink chucks, surely thinking of ways to mess with her brothers. Throughout the show’s four season run, multiple main characters wear chucks. Drake has both a black pair and an all-white pair that he switches between during the episodes. This fits in with his musician image, and his somewhat “bad boy” persona. In the later seasons, we also see Josh sport different pairs of chucks, usually a classic black pair. Finally, we see Megan wear a pink pair of chucks in the earlier episodes of the show. These characters wearing chucks definitely help set the scene and vibe of the show taking place in Southern California. Drake being held like a baby while wearing black chucks. Drake & Josh will always hold a special place in the hearts of a generation of kids who grew up on the live action shows of 2000’s Nickelodeon. The running gags, memorable side characters, and witty humor are etched in the minds of anyone watching Nick at the time. Along with other shows such as The Amanda Show, Zoey 101, The Brothers Garcia, All That, and Victorious, Nickelodeon produced a set of television series for kids based on friendship, family, and hilarity. Two brothers that won’t let anything come between them.